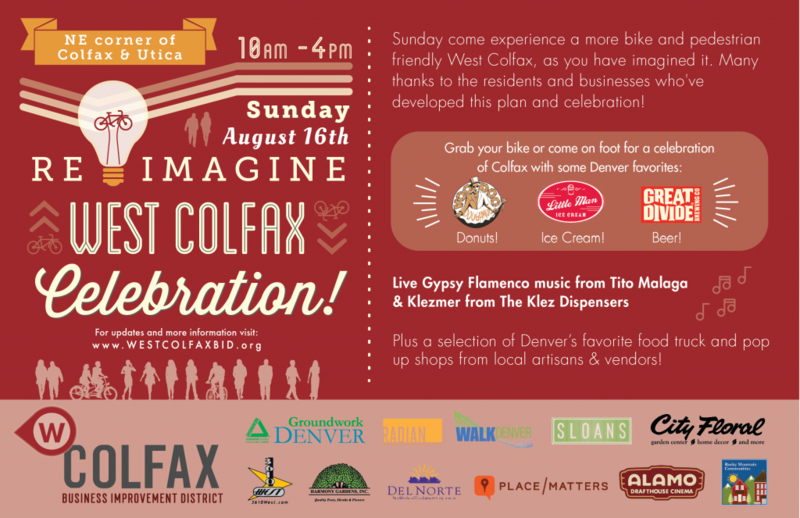 AWESOME PROJECT: Pedestrians and cyclists to storm West Colfax Avenue, Denver, on August 16th! Jack Kerouac, who spent time on Colfax Avenue in the course of his travels, called it the “longest, wickedest road in America.” It may not be the wickedest, anymore, but many do say that it’s the longest commercial street in the world. Lined with historic hotels still sporting their fantastic midcentury modern neon signs, Colfax has welcomed lots of new businesses in recent years. Bus lines and a new light rail station (finished in 2013) on Colfax have made the Avenue more accessible than ever. Despite all the development and redevelopment happening on Colfax right now, though, it’s still not a street you’d really want to walk or bike. Not yet. It’s too massive and car-dominated. Even crossing the street on foot can be dangerous. That’s why WalkDenver – along with partners like Place/Matters, and an army of planning students from the University of Colorado – started collecting data last year on pedestrian-Colfax interactions. They created an app called WALKscope (which invites users to enter location-specific data on sidewalk quality, pedestrian counts, etc), to help them identify specific interventions that might make Colfax more bike and ped friendly. 1. Tito Malaga will be playing live gypsy flamenco. 2. The Klez Dispensers (best band name in the history of band names) will be playing, yep, Klezmer. 3. Pop-up parklets on the sides of Colfax – sort of like the ones in NYC’s Union Square. 4. Three City Councilmembers will be in attendance to celebrate and make some remarks. 6. IF you complete the Tour De Donut pop-up protected bike lane loop – which will demonstrate three different kinds of protected bike lanes – you’ll get to nosh on free Voodoo Donuts. By the way, cyclists – City Councilman Paul Lopez has promised to bike the Tour De Donuts, so if you’ve ever wanted to enjoy a Captain my Captain with a local official, now’s your chance. Not gonna lie – we’re kind of jealous. How’s that for pedestrian visibility? There will also be a planted median refuge area in the middle of the street, so that you don’t have to make it all the way across in one go, as well as “bulbouts” at the ends of sidewalks, to further shorten the distance a pedestrian has to cross to get to the other side. It’s all about shrinking carspace and growing peoplespace. And what about cars, you ask, if pedestrians are going to be crowned king for the day? “Cars are welcome as guests, but they need to slow down and respect the people on foot,” says Locantore. Awesome. That pretty much describes our dream city, here at ioby. If you see any crazy community organizers charging the streets of Brooklyn with signs telling cars that they’re “welcome as guests,” that’ll probably be us. The best news of all is that this stuff is not pie-in-the-sky. The changes that WalkDenver and their partners are implementing on Aug 16 are totally, completely, 100% feasible as long-term, permanent solutions. So come enjoy the day, meet some neighbors, eat some donuts, drink some beer, and then share your feedback via the video booth and story board that’ll be set up for you. YOUR VOICE MATTERS, and the organizers can’t wait to see you. If WalkDenver’s work inspires you to take action in YOUR neighborhood, or if you have awesome ideas about how to make your town greener, safer, and more fun, let us help! Tell us your awesome idea right here. We’d love to help you get started today. Pssst…. In OTHER ioby news: Some great streets in LA are upping their games, too, and we’re helping them raise money to do it.